If you use a computer regularly, you should have a backup of your data. Copying your documents and photos to a memory stick is not a proper backup. Hard disks in PC’s and laptops are made up of a small aluminium disk that stores your data magnetically (see image). 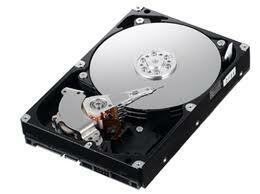 Anything that “demagnetises” your hard disk such as a power problem, can erase your data. Having a second copy of that data is critical to ensuring that your data is safe. Backing up to CD or DVD disk is pointless as the size of any backup is limited and in most cases, those disks cannot be used again. Get yourself an external USB hard drive that can be used with software to automatically backup your data at a set time each day/week.